Born in October of 1884 in Mentone, Indiana, Grover Evans Bell—the brother of famed Larry Bell of Bell Aircraft—credits his school teacher mother, Harriet Sarber Bell for instilling ambition and drive in her ten children, while further encouraging them to leave their small town to seek areas with greater opportunities, most of the siblings preferring California. In 1907, Harriet and Isaac Bell decided to retire, so Isaac sold his saw mill business and moved with his wife to California to be near their children. Grover, then 23, and his brother Will, found their parents a house in Santa Monica. They arrived by train, bringing with them their youngest child, the only one still living at home—13-year old Lawrence Dale Bell. Three years later in 1910, Grover took his fiancée, Margaret Kent, along with bothers Vaughn and Larry to Dominquez Field near Long Beach to see the nation’s first major air show. Some of aviation’s biggest names were set to compete, including Glenn Curtiss, Louis Palhan, Charles Willard, and Lincoln Beachey. Upon returning home, the three Bell brothers starting building model planes; but after a while, Grover, then a man of 27, tired of such amateur pursuits, deciding instead to immediately pursue a serious career in aviation. He looked in the Los Angeles telephone directory (under “Amusements”) for the leading local airplane manufacturer, the Glenn L. Martin Company. For $500, Glenn Martin himself taught Grover Bell how to fly. Martin was impressed, and Grover went to work for Martin as an exhibition flyer and instructor. In 1912, Grover sold some property and bought an old Martin pusher biplane (believed to be a Curtiss 1911 Model D) for about $2,500. 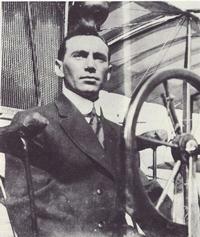 Grover went on the road with Lincoln Beachey, known at the time as the greatest of all exhibition pilots. Grover also continued to work for Glenn Martin in what was quickly becoming a special aviation fraternity, as newspapers continuously reported the exploits of Beachey, Martin, and Bell. Also in late 1912, Grover Bell was awarded license number 201 Federation Aeronautique International from H. LaVern Twining of the Aero Club of California. Grover continued to earn a living by doing numerous exhibition flights of all types. His brother, Larry had joined the exhibition team starting out as the mechanic. They traveled and lived in tents, hangers, repair shops, and sometimes in the open field itself, next to the airplanes. While this lifestyle certainly lacked luxury, an exhibition pilot could earn substantial money during those early years. Grover continued to master all known flying techniques, with Larry his main source of energy and enthusiasm. By 1913, their growing fame made them important members of the rapidly expanding Martin Company. The Bell brothers traveled extensively, making headlines each step of the way. Margaret Kent Bell, Grover’s new bride, traveled with Grover and Larry by train to Petaluma, California, for a July 4th, 1913 exhibition flight. Billed by the Petaluma Argus as “the flight that will be by far the best ever given in the country,” Grover commanded $750—an enormous amount in 1913. Grover and Larry assembled the aircraft and made some engine checks before the flight that day, previously determining that all takeoffs and landings, as well as stunts, could be safely conducted while directly in front of the reviewing stand on the half-mile racetrack. However, tall trees surrounded the entire area, forcing Grover to fly in and out through a single opening. At 8:30 AM on the morning of July 4th, Grover conducted a brief test flight to check his airplane. As he brought the plane through the opening for landing, he had to take immediate evasive action. Six race horses had been tied to a post, but the noise of the plane spooked them and they broke loose, running directly into Grover’s immediate landing path. By then, Grover’s plane was at a very low altitude and close to the ground. He tried to execute a 180 degree turn but dragged a wing and crashed. Larry Bell and Grover’s new wife rushed to his side and were with him several hours later when he briefly regained consciousness before dying the following day, July 5th, 1913, at a local California hospital. Grover Bell was 28 years old. His body was interred at Angelus Rosedale Cemetery in Los Angeles, California. Many dreams also died on that day. Grover and Larry Bell had been planning a company of their own, and they dreamed of a new line of airplanes which Grover’s exhibition flying would finance and Larry’s business acumen would organize and direct production. But while crating the broken pieces of his brother’s airplane, Larry Bell vowed that he wanted no more of aviation. However, at the persuasion of friends, that would later all change and Bell Aircraft Corporation, Bell Aerospace, and Bell Helicopter would all become realities. The GROVER E. BELL AWARD is given for an outstanding research and experimentation contribution to the field of helicopter development brought to fruition during the preceding calendar year. The Grover E. Bell Award was created by Larry Bell, founder of Bell Aircraft (now Bell Helicopter Textron) in 1957, in honor of his pioneering older brother, Grover E. Bell, who was killed in an aircraft crash in 1913. Eligible contributions include sub-systems as well as systems. The award consists of a 3-inch gold medal bearing the profiles of Lawrence and Grover Bell, a certificate, and a $250 honorarium.